New home communities in Arizona are popping up all over the place. The Crescentviews at Sonoran Mountain Ranch built by Maracay Homes offer patio homes with their flex design features. It is important to realize that these are patio homes. Patio homes have very small back yard. Basically enough for a pet to do their business, but not much else. There is enough room for a spa if you wanted to add one. The homes are great for those that don't wish to take care of a yard. There is a community pool since there isn't room for a pool in the yards. I took a picture of the pool, but wanted to make sure you could see the surrounding area also. The picture below is taken from the balcony of one of the model homes. Located near 67th Ave and Jomax Road. There are approximately 136 lots in the development. The prices range from about $180,000s to the mid $200,000s. The homes range in size from 1,166 - 2,518 square feet. Crescentviews at Sonoran Mountain Ranch is built by Maracay Homes. Families with school age children living at Cresecentviews at Sonoran Mountain Ranch are in the Deer Valley Unified School District. The links below will take you to the individual school's report card which indicates its status under the federal No Child Left Behind Act. Basically these reports can be used as a high level overview as to whether the entire school is performing well or not. Historically the Deer Valley and Peoria Unified Schools Districts the feed into the nearby new home communities in Arizona have been top performers. Tile flooring in the entry, kitchen, baths, nook, and utility rooms. Corian counter tops and sinks. There are many more standard features, but these were the ones that stood out in my mind as being different than what other new home communities in Arizona were offering as standard features. Maracay has won a number of awards for their new home communities in Arizona because of the flex design program that they offer. You can click through the links for pictures and descriptions of each home. Remember that the flex design options that Maracay offers allow you to customize these homes quite a bit, so don't pass over a model if it is listed as a three bedroom home and you need four. It may very well be able to turn into a six bedroom home by making some changes. The Ashford - is a single story with 3 bedrooms, and 2 baths, with a 2-car garage. You could convert the 3rd bedroom into either a master retreat or a den. It is 1,166 square feet and the starting price is just a bit under $180,000. Maracay does not have a model of this home. The links take you to the interactive floor plan. The Beret - is a single story with three bedrooms and 2 bathrooms. the most interesting option about this home is that you can convert the second and third bedrooms into a second master suite instead. The home is 1,359 square feet and starts at around $190,000. Maracay does not have a model of this home. The links take you to the interactive floor plan. The Cambridge - is a two story home with four or five bedrooms and three bathrooms. This home has a two car garage. There are many different flex design options, and again the most notable is that you can have a mother-in-law suite upstairs instead of the fourth bedroom. There is also the option of a courtyard in the front of the home. The home is 1,912 square feet and starts just under $240,000. Maracay does not have a model of this home. The links take you to the interactive floor plan. The Coventre is a single story new Arizona home with three bedrooms, two baths, and a two car garage. With this home you have the option to remove the second and third bedrooms and replace them with a den or an extended (very large) laundry room. The home is 1,379 square feet and starts at just under $190,000. The Denton - is a single story home with three bedrooms, two bathrooms, and a two car garage. There aren't that many options with this model. You can replace a bedroom with a den, and there is also an optional courtyard in the front of the home. You could also add a two way fireplace which is kind of unique. The home is 1,528 square feet and starts at just under $200,000. Maracay does not have a model of this home. The links take you to the interactive floor plan. The Essex is a two story new home for sale in Arizona with four bedrooms, three bathrooms, and a two car garage. There is a loft upstairs along with two bedrooms. You have the option to convert the lost into a fifth bedroom or convert both bedrooms into a second master suite. The home is 2,378 square feet and starts at just under $260,000. The Kent - is a two story home with three bedrooms, two and a half bathrooms, and a two car garage. This floor plan is interesting because you can swap out the covered patio for a den, reading room, or flip it into a bathroom with an extended utility room. The home is 1,567 square feet and starts at just under $220,000. Maracay does not have a model of this home. The links take you to the interactive floor plan. The Knolles is a two story new house with three bedrooms, two and a half bathrooms, and a two car garage. You have the option to convert the living room into another bedroom or a den. The home is 1,737 square feet and starts at just under $230,000. The Somerset - is a two story home with three - five bedrooms, two and a half or three bathrooms, and a two car garage. You have the option to swap out some of the rooms for additional bedrooms. The home is 1,851 square feet and starts at just over $230,000. Maracay does not have a model of this home. The links take you to the interactive floor plan. The Thorpe is a two story home with three - four bedrooms, two and a half or three bathrooms, and a two car garage. You have the option to swap out one of the bedrooms with a den and also add a walk out balcony off the upstairs master bedroom. The home is 2,035 square feet and starts at just over $240,000. Maracay does not have a model of this home. The links take you to the interactive floor plan. The Walden is a two story Peoria Arizona new home with three - six bedrooms, two and a half to four bathrooms, and a two car garage. You have the option to swap out one of the bedrooms with a den. Also upstairs there is a game room that you could convert into a second master suite. The home is 2,518 square feet and starts at around $265,000. There are only four models for you to view at this new home community, but Maracay makes eleven different homes at this subdivision. I wanted to have photos of the homes here so I searched other new home communities in Arizona that Maracay built to provide you with the exterior photos of each model. I know that is kind of crazy but I felt it was important for you to be able to see what the homes look like. If a photo is missing it is because I couldn't find this particular model anywhere. With all the different new home communities in Arizona it is tough to go look at all your options, but there is a good chance that the Crescentviews at Sonoran Mountain Ranch has what you are looking for. 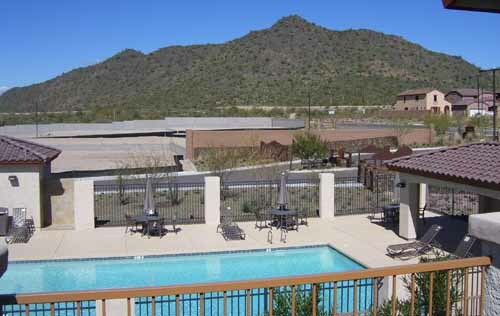 Out of all of the new home communities in Arizona, the Crescentviews offer a surrounding area that is beautiful, the home designs are very flexible, and the homes are affordable. The only drawback are the very small back yards, but if you are looking for a patio home then this could be the best of all the new home communities in Arizona for you. If you want to see other new home communities in Arizona visit our new homes section. I strive to have the most extensive Peoria AZ new homes section on the web. If you would like to continue looking at other new home communities in Arizona then visit our Peoria Arizona new homes for sale section. If you are ready to go visit this community please give me a call. I am very easy to get a hold of. Fill out a quick form to have new listings sent directly to your inbox. Find your dream home before someone else! Interested to find out what your home is worth? I'll prepare a market analysis of your home free of charge. Join Our Client Appreciation Program and find out how you can go on a vacation on me.